BANGKOK (AP) — Rescuers were searching Wednesday for hundreds missing in villages flooded when part of a newly built hydroelectric dam was breached in southeastern Laos. SK Engineering & Construction, one of two South Korean partners in the project, said in a statement late Tuesday that the top of one of five auxiliary earth-fill dams at the project "got swept away" on Sunday night after heavy rains. Repair work for the earth-fill dam was hampered by heavy rain, and damage worsened on Monday, causing water to overflow and flood seven out of 12 villages in the area, the company said. It was helping with rescue efforts and trying to contain further damage. 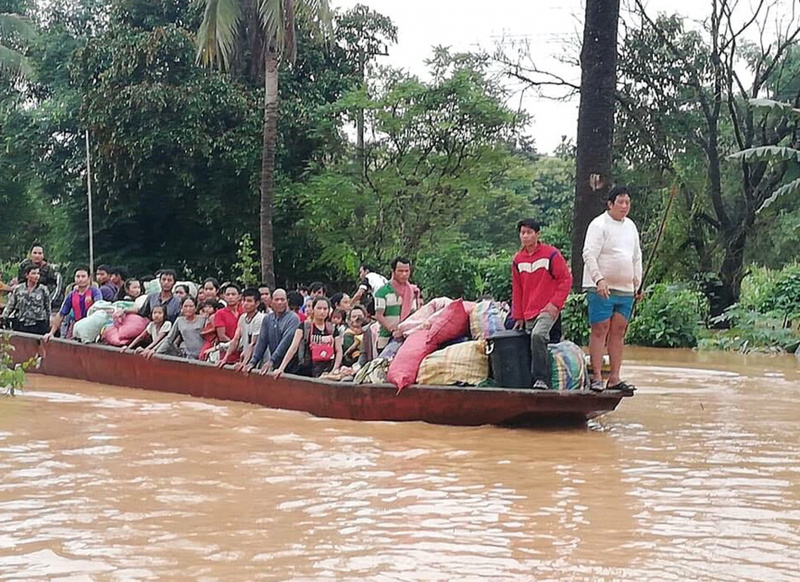 The cascade of 5 billion cubic meters (176 billion cubic feet) from the collapse flooded villages and left more than 6,600 people homeless, the official Lao news agency KPL said. It said hundreds of people were missing, without providing details. The website of the state-run Vientiane Times newspaper said Wednesday that two people were confirmed dead as of Tuesday afternoon. The government declared the area a disaster zone and top officials were rushing to the site, it said. Continued heavy rain and strong winds forecast for the area could hinder rescue efforts, and risks from flooding persisted in the mountainous region. SK Discovery Co., SK E&C's second-largest shareholder with a 28.25 stake in the builder, tumbled more than 10 percent to trade at its lowest level in more than three years. SK Holdings Co., the biggest shareholder in SK E&C with a 44.48 percent stake, fell 3 percent. But dam building along the Mekong River and its tributaries, including those affected by this disaster has raised concerns over environmental impact and other problems. International Rivers, a non-governmental group generally critical of such projects, said the catastrophe showed the need to improve warning systems.